Throughout this season, the St. Louis Cardinals have been encouraging fans to celebrate Red Schoendienst’s 70 years in uniform. Today, Major League Baseball commissioner Rob Manfred got on the bandwagon, asking fans to pay tribute to one of the franchise pillars by using the hashtag #LoveRed2. The 92-year-old Hall of Fame second baseman started his career in 1942 at the bottom of the minor league rung with the Cardinals Class-D affiliate in Union City, Tennessee. Three years later, save for a few months of World War II service in 1944, Schoendienst built a Hall of Fame resume with his continuous service as a player, coach, and manager for seven decades. Schoendienst currently serves as a special assistant to general manager John Mozeliak, and can be seen prominently at Cardinals spring training giving assistance to young ballplayers in a similar fashion that he received from Branch Rickey back in 1942. Once in awhile, he can still be seen wielding his trademark fungo bat, blasting rockets at infielders. Back in 1943, Schoendienst started with the Lynchburg Cardinals in the Piedmont League. After batting .472, the Cardinals quickly sent him to their top farm club in Rochester, New York. One of his teammates there was Jean-Pierre Roy, a future pitcher for the Brooklyn Dodgers. Speaking with Roy in 2011, he mistook the 20-year-old redhead as someone who was looking for a workout. “He came on a Saturday afternoon," Roy recalled. “I saw a guy walk in with a little glove, a white t-shirt, and of course, red hair. He looked like someone who wanted to practice with us." Roy wanted to make sure the unfamiliar face was in the right place. He extended an olive branch to the unsuspecting rookie. 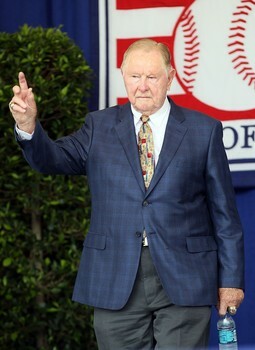 “I asked him, ‘Sir are you looking for someone?’ He said, ‘I’m going to the clubhouse.’ I said, ‘Follow me, I’m going.’"
It didn’t take long for Roy to notice that Schoendienst belonged. After watching him play that evening, he knew that the infielder was there to stay. “I later saw him in uniform, he was another ‘pure’ one (ballplayer)," Roy said.